Facts about White-faced Black Spanish chickens. The White-faced Black Spanish chickens although its heritage is still unclear, the White-faced Black Spanish chicken is considered to one of the oldest breeds of Mediterranean sub continent. This is also the first chicken that was imported to America before 1816. Spanish chickens have been recognized as most trustworthy egg layers in England. The breed was brought to America via Holland and became the most popular breed during 1825 to 1990. It started losing it popularity for two reasons, they couldn’t cope through the cold weather conditions in America and its weird white face. Harder breeds of chickens started to arrive post 1900 and the poultry owners lost their interest in Spanish chickens as they needed high maintenance due to the weather in America. The White-faced Black Spanish chicken comes with a white face and lustrous greenish-black plumage. It has a single comb which is always bright red in color and has five well distinguished points. The White-faced Black Spanish chickens comb stands upright and falls to the side in males and females respectively. It has thin, long and deep-red wattles. The wattles may have a white patch in its upper part in males. Earlobes are also white, but remarkably long and thin. It gives a strange look to their face which appears as melted and extended downwards. The shanks are look like slates. On an average, White Faced Black Spanish hens weigh 8 pounds (3.6 kg) while the hens attain a maximum of 6.5 pounds (2.9 kg) of weight. 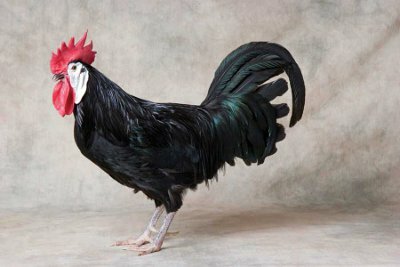 The black Spanish chicken takes longer time to grow than you can anticipate. The trademark white facial coloring isn’t there when it’s born. It takes about a year to change the color from black to white. It is an ideal option for the urban and hobby farmers who aim to sell eggs on a small scale, due to its prolific egg laying capacity. Raising a small flock of White-faced Black Spanish chicken would be enough for such people. The White-faced Black Spanish chicken may show friendly or standoffish personality. They like to make noises. So, farmers are advised to build the poultry at distance from their home.